Denture stomatitis is basically a sore mouth under a denture, caused by an infection, usually a fungal infection. Nearly all dental appliances such as dentures, retainers, anti-snoring devices, sports mouth guards and night-time bite guards are infected by bugs - and the most common is one is a microscopic fungus called Candida Albicans. But first, what IS denture stomatitis? It is a very odd word! What does it mean? The first word, "denture" is fairly obvious. It's something to do with a denture. The second word, "stomatitis", is made up of two bits - "stoma" and "itis". "Stoma" means something to do with the mouth. And "itis" means something to do with inflammation, like "dermatitis" or "appendicitis". SO - denture stomatitis is an inflammation of the mouth caused by a denture. BUT IT'S NOT AS SIMPLE AS THAT! On it's own, a denture will not cause an inflammation. Something else has to get involved. And that something is most usually Candida Albicans. When you get a fungal infection under a denture, the gum tissues become very red, slightly swollen, and quite sore. You can also get sores at the corners of the mouth. What can be done to treat a denture infection? There are two approaches. On the one hand, we need to deal with the fungal infection in the soft tissues of the mouth. BUT WE ALSO NEED TO TREAT THE FUNGAL INFECTION ON THE DENTURE ITSELF. If we only treat the fungal infection in the mouth, we are ignoring the reservoir of bugs on the denture itself. This will just re-infect the mouth tissues again, and you will be back to square one! There is an amazing new product available, developed by expert dentist Dr. Lorin Berland, DDS, of Dallas, Tx.. 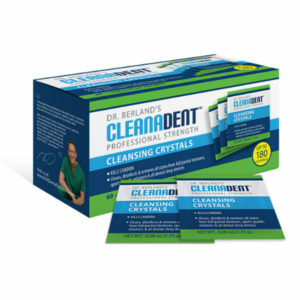 It is called Cleanadent Crystals, and it KILLS all Candida on any denture or oral appliance within 20 minutes. This is an incredible development in the treatment of denture sore mouth caused by candida infections! You should use the Cleanadent Crystals every day, to soak your dentures or oral appliance. The minimum time recommended to kill all candida and streptococcus bugs is 20 minutes, but longer is better! Regular use of Cleanadent Crystals will eliminate these bugs, and prevent you getting a re-infection. If you have a fungal infection in your mouth already, you will need to take some medication such as Fluconazole to get rid of this. But remember you have to disinfect your denture or oral appliance too! I STRONGLY recommend Cleanadent Crystals. The inventor, Dr. Berland, also recommends ultrasonic denture cleaners to make sure you get the best results. I recommend that you take a look at my review of Ultrasonic Denture Cleaners to find out which one I recommend, and HOW TO GET A FREE ultrasonic denture cleaner from Dr. B Dental Solutions!